Generally, these cabinets function the same way (materials may be different in some cases, such as corrosives and acid cabinets). 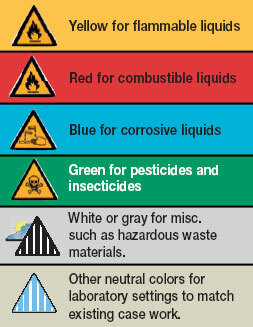 But when it comes to safe storage of flammable or hazardous liquids, easy identification is key, and color is one of the best ways to differentiate the various type of cabinet to use for a particular liquid type. If you have questions about safety cabinets, contact Cisco-Eagle customer service.